OMG, I am a dinosaur. I still vividly remember the first time I stepped outside to talk on the telephone. 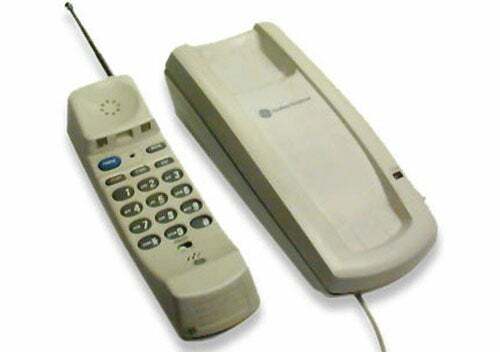 I was in high school, and my family had just gotten a 27MHz Sony cordless phone. It felt like magic, extending the metal antenna and walking away from the receiver … farther, farther, until I opened the sliding glass door and stood on our patio. It felt like magic. Then I shivered. It was cold outside. After a few minutes, the wonder wore off and I came back inside and sat in the chair by the receiver. I’ll do my talking in the warmth of my house, thank you. I remember feeling that cell phones might have some value — especially since they came right after a phase where people wore wireless gizmos that buzzed to tell them somebody wanted to talk to them. Carrying the phone itself seemed like a natural next step to remove the middle man that was the beeper. For many years, I failed to get the point of texting. Email was already established, and I just couldn’t see the value struggling with a phone keypad to send cryptic messages to people when I could just call them. Of course, it eventually dawned on me that I hated talking on the phone, and that texting could replace most times when I’d need to call somebody. I share this as a way of introducing an ongoing topic of conversation with parents and teachers everywhere — making sense of the role of social media in our lives. By this point, we’ve all heard the horror stories. Oversharing. Bullying. Lives forever changed by an inappropriate post or picture. In March, the Cary Academy Upper School hosted two days of conversation with Dr. Yalda Uhls on “Avoiding the Pitfalls of Social Media.” Dr. Uhls works with Common Sense media and is the author of Media Moms and Digital Dads: Parenting in the Digital Age. 49% of teens say text messaging (including on messaging apps) is their first choice of platform for communicating with their closest friend. 20% say social media is their first-choice communication tool when talking with their closest friend. 13% say phone calls are the method they would choose first to talk with their closest friend. 88% of teen social media users believe people share too much information. 68% have experienced drama among their friends on social media. 53% have seen people posting about events to which they were not invited. 21% report feeling worse about their own life because of what they see from other friends on social media. Importantly, 68% report getting support from friends via social media during rough times. As parents, our most important task is to be a good social media role model and to form relationships that can keep the lines of communication open with our children. We may have a need early in the social lives of our children to exercise tight oversight — through limiting access, sharing passwords, or filtering content. As our children mature, Dr. Uhls urged parents to turn the keys over to our teens and substitute communication for control. Our kids need to learn how to exercise judgement and having a non-judgemental, trusting relationship with their parents will make it more likely they would turn to us should trouble happen. Interestingly, if parents are worried about kids oversharing on social media, students also report concerns about what their parents share about kids on social media. Wearing grandma’s gift sweater to dinner was the right thing to do, but it was not an image meant to be shared with the world! No matter how much long for the pre-iPhone days, we are not going to be able to “scare” kids off these platforms. Social media is woven into the fabric of our communications. Danah Boyd, author of It’s Complicated: The Social Lives of Networked Teens spent significant time researching and talking with teens about their social media use, and she believes that while the issues bear attention, concerns are often overblown. At Cary Academy, we support our students growth and development through regular advisory programming regarding technology, social media, responsibility, and decision making. In 6th grade students learn about digital housekeeping, digital etiquette, and cyber permanence. Parents of 6th grade students are invited to attend a parent coffee on Parenting and Social Media. In 7th grade, students study the brain and technology and consider the concept of a healthy digital diet. In 8th grade students look at social power both on- and off-line. In one activity students analyze a fictional case of inappropriate use of social media and consider a framework for healthy decision-making. In addition, Drs. Matt Ezzell and Millie Maxwell speak to the 7th and 8th grade students on being wise consumers of media. In 9th grade, advisors run activities on media messages and how they affect the brain. The students and adults also address the issues of conflict resolution, looking at personal values and communications skills. In 10th grade, student focus on how to act as agents of positive change in all aspects of their lives. Conversations about social media, digital footprints and the power of networking take place throughout the junior and senior years. So it is time for this dinosaur to get back at it. I’m proud to report that I’ve found a good use for Twitter (snow days, anyone) — although I’m still struggling to understand Snapchat.